And you can hold her too. She is the sweetest, and only 1 yr old. BUNNY arrived at Last Hope from Babylon Shelter where she entered in early February as a stray with a bad, de-gloving wound of the tail. She was immediately sent to the specialist (NY Vet in Farmingdale) where her whole tail was amputated & she was spayed at the same time. 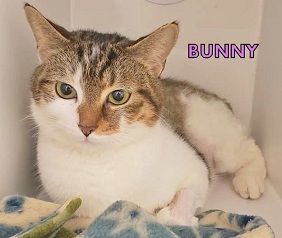 BUNNY is waiting for you to behold & hold her at Last Hope Cat Center in Wantagh. This entry was posted in Adult, Cats, Female, Wantagh Adoption Center. Bookmark the permalink.